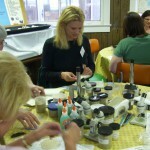 The Ocean County Soil Conservation District strives to lead efforts to protect and conserve our soil and water resources by providing educational programs and workshops to members of the community, including homeowners, teachers, students, scouts, farmers, public officials, various state and federal agencies and non-profit organizations. Choose from a variety of program topics and book a program for your organization, or register to attend a free program, presentation or workshop open to the community by contacting Becky Laboy, Education Outreach Specialist, 609-971-7002 ext. 114, Education@SoilDistrict.org.